Best Picture winners at the Academy Awards stick to a well-thumbed manual. It’s a pantheon crowded with mafia bosses, adultery, flashbacks, fist fights and dream sequences, not to mention a miles-long parade of naked bodies. 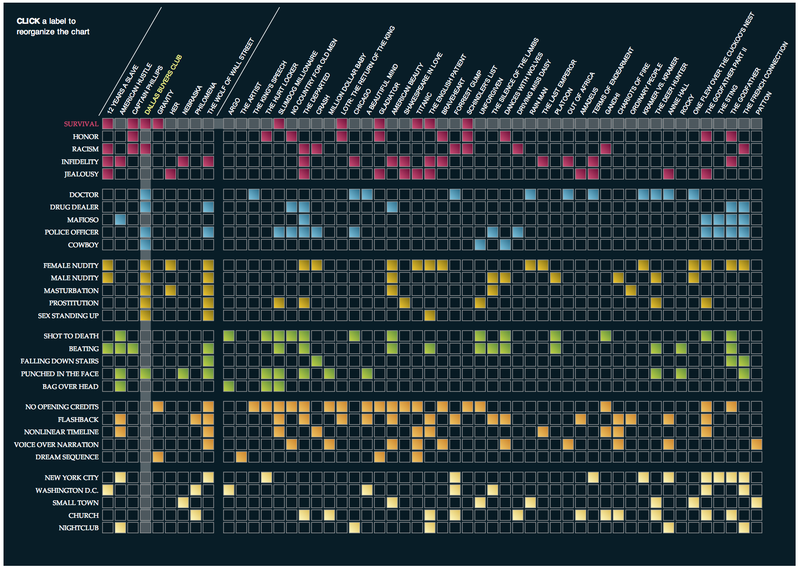 This chart uses IMDB keywords and original research to chart 30 of the most common themes, characters, locations and patterns from every winner back to 1970. See how the nine movies up for this year’s nod compare to past Hollywood royalty. Click the labels to reorder the boxes. While packing a movie full of popular keywords doesn’t make you a winner—otherwise, The Wolf of Wall Street would be the runaway favorite—there are some lessons to be learned. Many past winners have laid off the opening credits, and nearly twice as many winners featured naked women rather over naked men. Houses of God also show up twice as often as nightclubs. With all the violence and infidelity going on here, that might be a good thing.